Having trouble getting the sleep you need? As we all know, sleep is imperative for good health. Our bodies rely on getting those 7-8 hours a night, and when we don’t get them, we feel sluggish and exhausted the next day. This affects our daily routine and overall happiness. Here are 15 useful tips that will help you get some zzz’s. It’s recommended that you dim the lights in your home about two hours before you’re reading to hit the sack. This essentially acts as a signal to your brain that bedtime is approaching, relaxing the mind. I know we all love our lattes and white wine but you’ve got to save those for earlier in the day if possible. We all deserve a night out with the girls every so often but just be prepared that you probably won’t be getting a good night’s sleep that night (or perhaps you’re counting on it). While you should avoid eating a large meal before bedtime so as not to overwork your digestive system, a light snack may actually help you fall asleep. Certain foods are known for their “sleepy” qualities. Almonds: These little guys are jam-packed with magnesium which helps you fall asleep. Cheese: Cheese plate, anyone? Calcium, which is found in any dairy product, helps increase melatonin levels. Bananas: I know the saying is “an apple a day can keep the doctor away,” but don’t underestimate bananas. Bananas are filled with magnesium and potassium which will help you in your effort to doze off. Cereal: Yes, your evening bowl of milk and cereal can help you sleep because of both the calcium and carbs. After taking a warm shower, you’ll step out into your room and immediately feel the colder air. This drops your body temperature and with that, your metabolism. 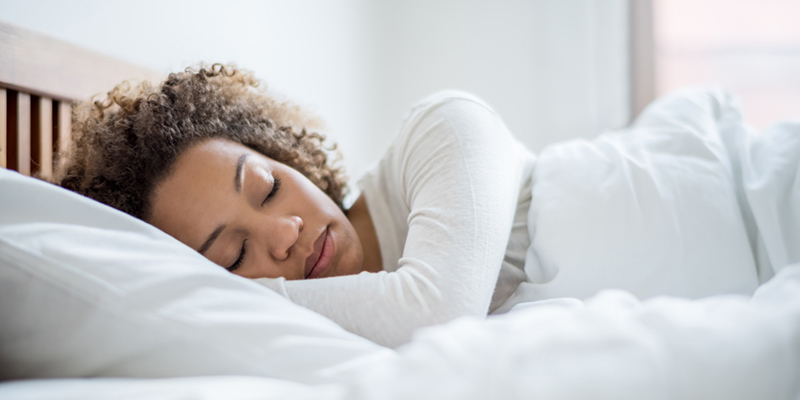 When your metabolism slows down, it signals to your body that it’s time for sleep. Let your skin breathe. If you’re wearing something too tight and uncomfortable, you’re going to wake up in the middle of the night frustrated. Opt for something cozy or just wear your birthday suit. Have to stop by the grocery store. Don’t let all these thoughts take over when you’re supposed to be getting some sleep. Write out tomorrow’s to-do list and then close the book on those thoughts until tomorrow. They can wait until then. According to The Wall Street Journal, the best sleeping temperature is 65 degrees Fahrenheit. The worst feeling is waking up overheated so keeping the room cool is much more conducive for deep sleep. Take a moment to clear your mind through meditation. Close your eyes and hear your slow, calming breaths. Picture yourself somewhere else, somewhere peaceful, and notice that your body relaxes with the dreamy scenery. Speaking of breathing, the 4-7-8 method is another popular tool that is similar to meditation. Created by Harvard-educated Dr. Weil, this technique involves a cycle of inhaling, exhaling, and holding the breath. Step 1: Exhale completely through your mouth, letting all the breath “whoosh” through you. Step 2: Close your mouth and quietly inhale while counting to four. Step 3: Hold your breath for seven seconds. Step 4: Exhale completely while counting to eight. Step 5: Inhale and repeat the cycle three more times. It is said that this technique will allow you to drift to sleep. White noise can help you fall asleep and stay asleep. The constant calming noise decreases the chance of being disturbed by a “peak” sound, such as a creak in the floor or a car engine starting. It helps diminish the effect of sounds that would otherwise negatively impact your REM cycle. Don’t have a sound machine? You can also use a fan. This is especially helpful in the summer when some extra air circulation is needed. One of the most popular activities before bed is getting cozy and reading a book. Reading helps you de-stress and relax before bed, especially if it’s something you do on a regular basis. You’ll become used to the literary routine and associate it with falling asleep. Get lost in Neverland, cast a spell at Hogwarts, or travel back in time to your favorite century. When you drift off to sleep, the story may continue in your dreams. This is similar to what we talked about in #8, except make sure you’re lying down on your organic pillow with your eyes closed. Get yourself in your usual sleep position and think about a tranquil place—perhaps an ocean view, the quiet woods, or a field by your house that you love to lay in as you take in the beauty of nature. Whatever the scenery, concentrate and let the waves or birds chirping surround you. Eventually, you will get sleepy. You can also try the super old method of counting backward. Start in the 300s. You won’t make it to zero. Try not to look at your clock once you get into bed. When you stare at the time, you’ll simply become more anxious as you obsess that ten minutes, twenty minutes, thirty minutes have passed. I know it’s tempting but do your best to look the other way. Not only is there a clock on your phone but there are all sorts of apps that can get you into trouble when you’re supposed to be sleeping! Not to mention that the light from your screen affects your melatonin levels. Keep your phone at a distance so you can focus on those eight hours of sleep. A nightly routine is the best way to wind down for sleep. Sleep can bring us joy, and this joy can positively affect so many aspects of our lives...in and out of the bedroom. Summer can be beautiful, but the heat can make it difficult to sleep. Here are our suggestions.